Romantic relationships are sometimes uncanny and hard to understand. How would you know your guy does not like the way you behave? 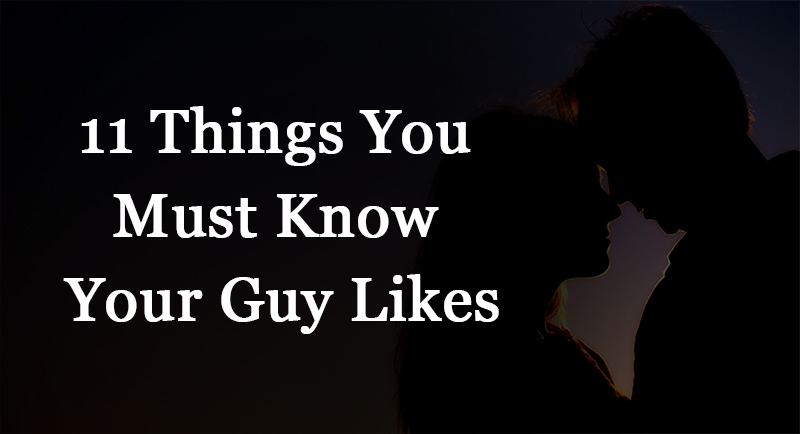 Let’s shed some light on things you must know your guy likes! Cuddling is a way to feel warmth of your partner. It’s comforting and guys like a nice cuddle every once in a while. They need to be told time and again about what you wish and expect from them. Guys lack in mind reading and guessing if their partner needs something. It’s their natural way of solving problems, to give advice, even if you’ve not asked for it. They suggest ideas to draw another perspective of the situation that you’ve been going through but you might not see it that way. It can be frustrating but do understand that guys take their girls’ concerns seriously. Guys will try hard to win your heart but don’t give them too much hard time that they don’t have any urge to get to you. Try their patience but not stretch it too far. They show their best rugged and rough exterior but from inside a guy lives a creature of insecurity. They will pretend that they don’t need your care or attention but beneath their manly shell, they all crave for it. They will crack jokes that are truly funny but sometimes their witty quips aren’t that witty. Please don’t ruin moments by not responding to his funny acts. He likes to make your comfortable and for that they will make you smile, may be at unexpected moments. If you think that you can mark your position in his life by making him jealous then be aware to test the waters as he might end up going away from you. Your relationship can suffer if you stretch his limits deliberately. Don’t expect your guy is the most docile creature and he can never take your comment on his ego. Try it once and you will get to know about their insecurities. They are incredibly insecure even If they don’t show it too often. Privacy is important to everyone. If your partner likes to spend some time alone that does not mean he’ll go off looking for someone else. This is not absurd but a genuine way of some guys to spend most of their time with their favorite girl. You might be surprised but your guy may be like going out for shopping, trying a new haircut every month or love watching romantic comedies. Guys like their girls in their truest form; no pretending. If you think he will only like you when you’re dolled up in a pretty dress, you’re wrong. He likes to spend time with you even when you’re barefaced and wearing pajamas only. 7 Things Revealing What Your Guy Desires in a Relationship?